When it comes to southern food, one dish that comes to mind is Chicken & Waffles. This dish may seem like an odd combination, but if you appreciate both sweet and salty flavors, then you should definitely give this a try! For my Chick Flick event where we watched the southern film, Steel Magnolias, this was a great addition to my southern inspired menu. Confession... It's not quite a real recipe but more like a Sandra Lee-esque concoction - lol! Cut waffles into quarters and place on one side of a baking sheet. On the other side of the baking sheet, place your chicken nuggets. Place baking sheet in the preheated oven and bake for about 5-10 minutes or until both chicken nuggets and waffles are crisp. 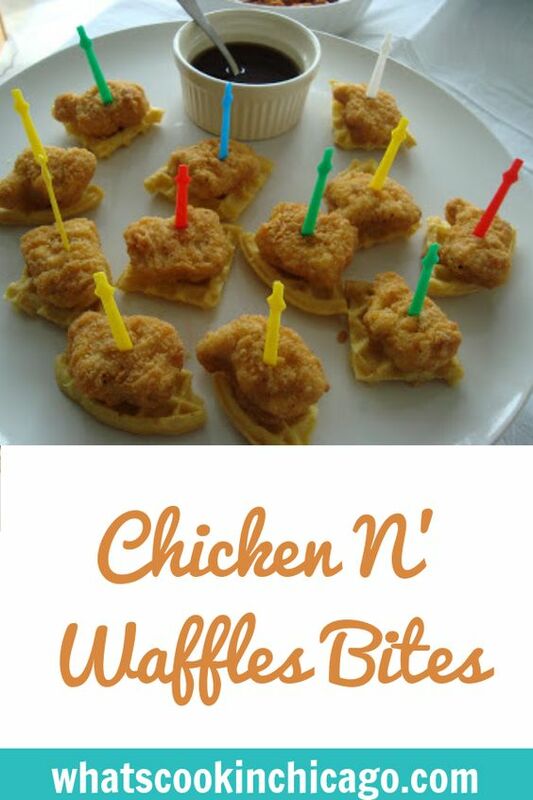 Remove the baking sheet from the oven and place a chicken nugget on top of each piece of waffle. Secure with toothpicks and serve with real maple syrup for dipping. What a great idea - I love it! I'm sure they were a huge hit! I had never seen these in Tennesee my whole life. As soon as I moved to Virginia I saw a couple places advertising Chicken and Waffles. I have yet to try them. I will have to do this one night just to see how the combination is. I find it very interesting that someone decided one day to mix the two great foods togther. Thanks for the idea to try this at home. Joelen - this is genious! I've always been intrigued by the combo, but I think anything larger than bite sized might be too much for me to handle. These little bites are perfect! I'll have to try it for sure. The perfect snack/appetizer for this movie and so easy to make up. I absolutely love the sweet and salty combo. this is hilarious. my hubby would love these! I love this idea! It is too cute!! I love this idea! I need to do this for some English people. They will think I am absolutely BONKERS!!! I can't wait to try this. Great idea...gonna play with this one a lil'.